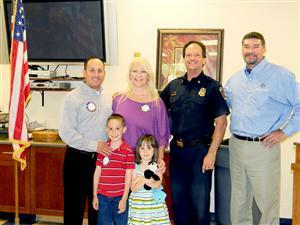 EDH Rotary names Jeno Inzerillo Firefighter of the Year. Surprising El Dorado Hills firefighter Jeno Inzerillo with the Rotary Club of El Dorado Hills Firefighter of the Year award wasn't easy. "When I told Jeno to report to the senior center I think he thought we were retiring him out," joked EDH Fire Chief Dave Roberts and Wednesday's breakfast meeting. Instead, Inzerillo, with his wife Sally and their two children Anthony, 7, and Grace, 5, was greeted by fellow firefighters, the chief and a room full of applauding Rotarians. "This was a huge, huge surprise," Inzerillo said. Inzerillo stood out in the department because of his work with the El Dorado Hills Fire Department's Explorer Program, which teaches youth ages 15 to 18 about a career in the fire service as well as providing them with a sense of responsibility to their neighborhood through ongoing community related activities, according to information posted on edhfire.com. Inzerillo approached the chief about starting the program two-and-a-half years ago and, Roberts noted, "He has built it into an amazing program." A humble Inzerillo thanked the chief and Rotary for the award, saying he feels honored to serve the residents of El Dorado Hills. Though he's worked in several jurisdictions over the years, Inzerillo insisted, "This is the best community."